Could top-up payments for NHS care be the start of an insurance-based health system? The recent decision to consult on lifting the ban on topping up NHS care means this blockage is likely to be lifted in England sometime in 2009. The government accepted all 14 of 'cancer tsar' Professor Mike Richards's recommendations and has put the proposals out for consultation until the end of January. If the proposals are agreed, it means that patients will get the right to pay for top-ups without losing their basic NHS package of care, but only under strictly regulated conditions. Those paying for extra drugs will also have to cover the cost of any staff time, tests and scans associated with that treatment. This means patients will have the right to choose to 'co-pay' for their treatment, which is fundamentally different from other co-payment for drugs (the prescription charge). • If a drug has positive NICE technology appraisal guidance for the relevant indication, then it must be made available on the NHS. • If not, a primary care trust (PCT) may have a local policy to fund the treatment, perhaps based on collaboration with other PCTs or, in the case of cancer drugs, advice from a cancer network. In this case, it should be made available on the NHS. • If not, a clinician can apply to a PCT for exceptional funding. If this is successful, treatment should be funded on the NHS. Only once these options have been exhausted should patients have to consider whether they wish to purchase the additional treatment privately. If you take the case of cancer drugs specifically, which seems to be what triggered this review, since NICE was established in 1999, it has assessed 56 cancer treatments, of which 52 were approved for funding and only four rejected – which puts the scale of the issue in cancer in perspective. The charity Rarer Cancers Forum estimates that, for cancer, about 800 patients a year apply unsuccessfully for exceptional funding and so may want to top up their care. This may understate the numbers who would top up if all patients were fully aware of all drugs that may be available but are not funded by the NHS. Prof Richards said there were around 15,000 applications a year in England from patients seeking drugs not covered by the NHS. A Department of Health (DH) survey, to which 80 PCTs responded, highlighted that applications under the 'exceptional circumstances' approach averaged 177 per PCT. Of these, 26 per cent were for cancer and 74 per cent for non-cancer conditions. Sixty-four per cent of cancer treatment requests and 74 per cent of non-cancer treatment requests were approved. The demand for top-up availability may be less than imagined. There may be a worry that NICE will now license fewer new medicines for NHS use, knowing that patients will be able to access them with their own resources. The NHS could be 'off the hook' on recommending use – and therefore funding – of drugs that are readily available elsewhere in Europe. It could, in theory, set up a situation where NICE can actually lower the value threshold further, knowing that patients will pay for it themselves, resulting in yet more cost saving for the NHS by the back door. Yet the proposals do hinge on the NHS making more drugs available by raising the threshold it is willing to pay for treatments for 'end-of-life' illnesses, with NICE conducting a five-week review. However, this will apply to drugs for terminally ill patients with rare conditions only – affecting fewer than 7,000 new patients a year – where the bill for the drug will be greater than NICE's £30,000 per year threshold of cost-effectiveness. Some cancer charities have expressed concern that, in the longer term, a concept of 'separate care' will develop, and act as a disincentive for NICE and PCTs to approve the use of future treatments – including the 69 bowel cancer drugs in the pipeline – and will, in turn, force more patients to pay privately for drugs that should be available to them on the NHS. Perhaps it is not just NICE we need to worry about. With the drive to practice-based commissioning, it could be possible that local commissioning bodies will give in to temptation to save money by refusing treatment – which would otherwise be available or is available elsewhere – on the grounds that patients may now pay for it themselves. This would exacerbate the issue of regional discrepancies or 'postcode prescribing' even further. The review has tried to address this by suggesting greater collaborative working to deal with drugs not reviewed by NICE. Hopefully, this will also spin off into local commissioning. However, it is dependent upon the DH considering how PCTs can be encouraged to work together to make proactive commissioning decisions and policing by the strategic health authorities. Another worry is that if decisions are so transparent that drug companies know what price they can set to have their product approved, prices could be pushed up. To soften the financial blow to trusts, ministers are also seeking to get better deals from drug firms through the use of risk-sharing pricing, such as refunds when the drug does not work or a sliding-scale of cost whereby the NHS pays more if the drug continues to be effective over time. Some companies, such as Johnson & Johnson and Novartis, have already negotiated such risk-sharing deals. However, these could involve value-based pricing models, which place an administrative burden on the NHS because they require more auditing. So is this the first step towards an insurance-based health system – or at least one with mandatory top-up insurance policies? Prof Richards addressed this specifically in his letter at the front of the report, asserting that this was not likely, as he had developed a "clear framework for how the NHS should deal with top-up payments" while trying to ensure the number of patients is kept to a minimum. If patients are going to pay for the treatment, then how will they decide if it is worth it and know what is the best option? NICE chief executive Andrew Dillon himself felt that the plan was recognition of the "considerable value" patients place on treatments that can extend life when they are close to death. It is this value which has meant that patients are prepared to pay large sums for drugs not available on the NHS and prompted the review of the rules on co-payments in the first place. The review requires doctors likely to have conversations with patients about treatments not routinely funded on the NHS to have "the necessary knowledge and skills to communicate complex information effectively and in a balanced way". Obviously, it will be up to the royal colleges and the DH to ensure training programmes are put in place and that assessment skills are incorporated into recertification processes. The DH is to consider how balanced, written information on the benefits, toxicities and, where appropriate, costs of 'novel treatments' could be provided to patients. One thought is to have an independent adviser, separate from both the pharmaceutical industry and from organisations trying to contain costs. Given the difference in prices across Europe, it may lead to more 'medical tourism' where people go abroad for treatments that are not available in the UK. No doubt, there will be some who will consider cheaper options than paying UK prices. However, when it comes to cancer, this is not as simple as going into a hospital overseas for a single operation. Cancer treatment tends to be for a protracted period, which will make going abroad potentially less attractive. GPs are broadly behind top-ups, but would prefer NHS funds for those who cannot pay. They feel that allowing NHS patients to top up treatment with drugs paid for privately fails to resolve the fundamental issue of access to expensive medicines in the NHS. One worry among doctors is that this will lead to ever greater attention on the rare and expensive drugs, with basic needs being ignored. There is a fear the industry could be in for a PR disaster as sick patients start losing their homes because they have spent so much on pricey top-up drugs. There is potential for some heart-wrenching stories. No matter that it is an individual's choice, the fact that they have had to sell their house or use their life savings will not reflect well on pharma. It is too easy to target someone to blame, and the industry is the obvious 'bad guy'. After all, in the UK it is the company that sets the price, not the government. Care will be needed to head these challenges off before the media get up a head of steam. This is a sensitive and difficult issue. At least patients, their representatives and the health service now know the context in which they can conduct their negotiations. 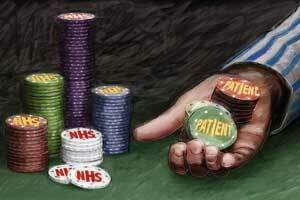 The full impact of the reforms on the NHS will not become clear until all the detail is fleshed out. This is not the thin end of the wedge, but rather a pragmatic solution to a problem of gargantuan proportions – ensuring a level of care for all, while accepting that, in certain cases, people need the right to choose what they feel.